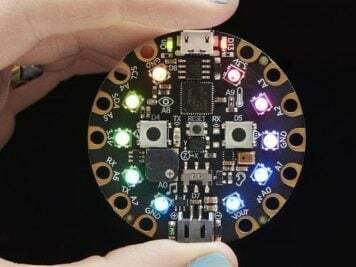 Updated Tutorial: Adafruit MENTA Kit @ Adafruit Learning System « Adafruit Industries – Makers, hackers, artists, designers and engineers! Introducing the MENTA, a portable minty Arduino-compatible project that fits into a common mint tin. 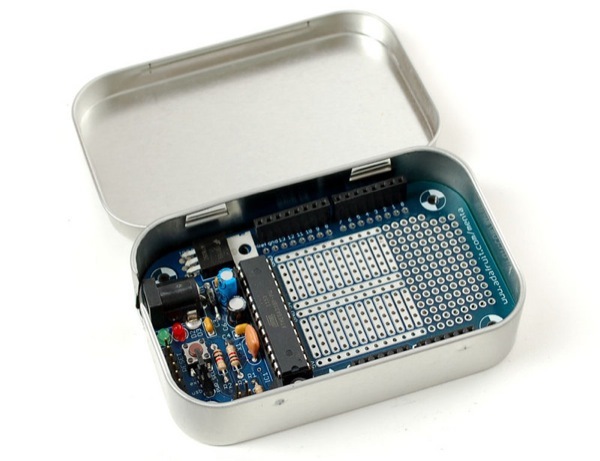 We took our super popular Boarduino series, and wrapped it with a prototyping area into a rounded PCB that slots directly into an Altoids-sized metal tin. We included everything you expect to jump-start your project: a DC power adapter with polarity protection, beefy 1 Amp 5V regulator and 250mA 3.3V regulator for 3.3V devices, green power LED, red blinky LED, ISP-6 standard reprogramming header, FTDI interface plug to connect an FTDI Friend or cable and female header so you can plug standard Arduino-compatible shields in. There’s four mounting holes if you want to attach it permanently to a box or plate, and a massive prototyping area so you can have the finished project all fit together in a protective box. That’s really awesome! Especially like the fact it has 5v and 3.3. Now if… a battery pack could somehow be attached to it, that would be awesome++ ! !